Hi Paint Party Friends! It seems I’ve been missing to0 many PPF link ups because I’m missing all you guys. Those of you visiting who haven’t heard about PPF , it’s a Linky Party where artists share their paintings….beginners to professionals. It’s a wonderful place to meet other creatives. 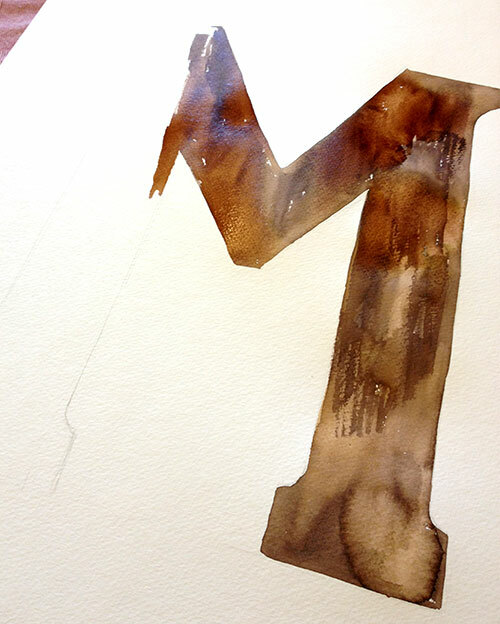 Now, onto my recent painting, a Large Letter M. Exciting, isn’t it! I painted this to go on my ‘M’ wall, I got the idea from Emily @ Jones Design Company . I loved her wall so much I had to recreate it in my entry. I’m making lots of changes to my house, check out my 52 Projects Notebook on Springpad. My goal is to complete 52 projects starting from November 17, 2012 to November 16th, 2013. I will post each project here starting Monday, Dec. 3 2012. Back to my ‘M’….I sketch this out on large watercolor paper and painted away with my watercolors. I wanted a lot of texture and an old look and that’s what I got. Yay! When I started painting I thought it was going to be too dark but it turned out just right. I used water and a dry brush over dry paint then added more water. The paper did ripple a little but it flattened after it dried. After it was dry, I trimmed the edges and stuck it into a frame. What do you think? I’m posting this project on Monday with a full view of the wall, I’d show you today but I’m still adding some finishing touches. I’ve been all caught up everywhere but the blogging world, Kristin! And now I come back and see this gorgeous thing. Absolutely elegant. You have a real talent for design! Love the weathered and antique look of this! you really did get a lot of great texture. I can’t wait to see the whole wall. It sounds really cool! Gosh never knew an ‘M’ could looks o great! Happy PPF. this is fantastic!!! I love the weathered look and colors!!! Happy PPF! Love this and LOOK….it’s the letter M for me! :) I the frame…..beautiful! Oh and Moss grows EVERYWHERE here in Oregon. it almost ruined our roof and it does ruin the trees. Thanks for visiting me. Love this idea, and your sweet litle bird calendars are sooo cute! Fabulous ‘M’ painting. Love all the textures. Beautifully framed with the distressed look too. 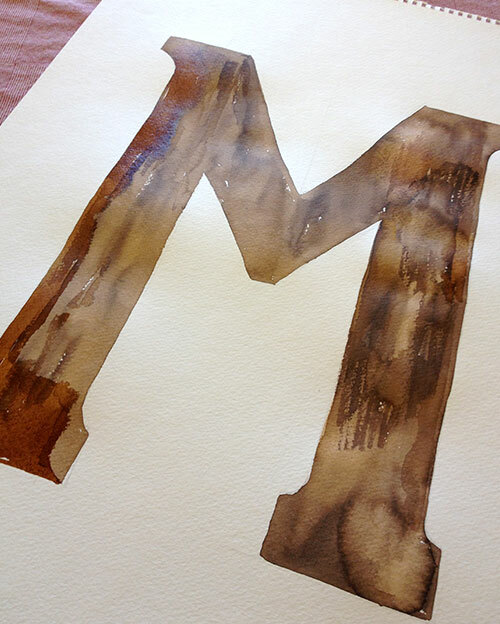 I love the M. The color is great and the texture just makes me want to reach out and touch it. I can’t wait to see the rest of the wall. 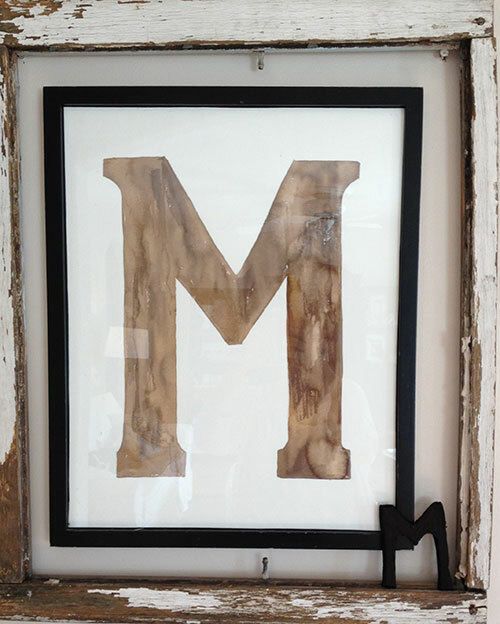 Love your M painting, great textural and aging effects and adore how you framed it with the old window pane…Delightful! Happy PPF! How very cool, a wall with all types of letters. A fun project! I love the very watery painting with the straight lines of the M – great combo! Happy PPF! I love it!! Its so rich, beautiful! Yes, it really looks worn and old, and fits perfectly in that frame. Well done! I love the way it turned out! Great texture and the color is beautiful. Love it, looks wonderful in that frame! Great job! M is for magnificent! Such a great idea!! Happy PPF! Love your piece. It’s absolutely gorgeous!! This is great, it looks like rusted metal or aged wood. Beautiful texture! Love this idea! I may; have to paint a “K” for my wall of K’s! Great idea! Wow, this is incredible. It has an awesome wood grain effect.